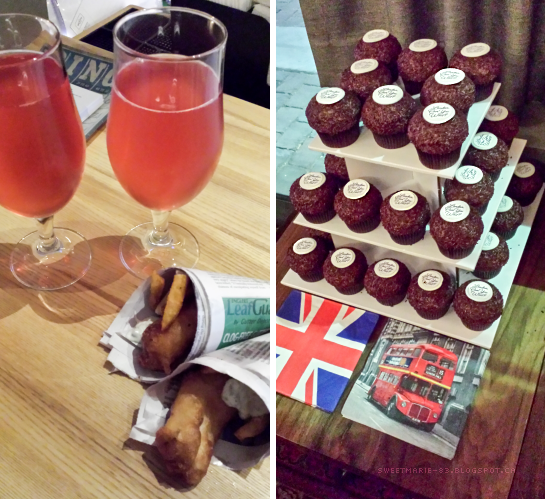 It’s been a little over a month since Jacquelyn Middleton’s launch party for London, Can You Wait? and I’m finally getting around to writing about it. Between real life stuff (including what seems to be a fun new problem with chronic headaches that I’m getting checked by my doctor today), and launching my own book, I just haven’t had time for blogging. But...better late than never, right? I met Jacquelyn on Instagram shortly after she released her debut novel, London Belongs to Me. I always hoped to meet her someday, especially since she only lives a couple hours from me, so I was thrilled when ‘someday’ turned out to be much sooner than expected. Getting invited to Jacquelyn's launch party for London, Can You Wait? was exciting enough, but I didn’t actually expect to be able to go since I don’t drive and my anxiety prevents me from travelling solo. Enter my friend Krista, a proposition for a mid-week mini vacation to the city, and an invitation to what promised to be an epic party, and things came together perfectly. And it really was an epic party. Held in the Nest (a very cool, intimate party room) of the Wickson Social, the launch was the best party I’ve ever been to. Before we went, Krista and I joked about getting to attend a ‘grown-up party’; despite both of us being close to our mid-thirties, neither of us truly feels like ‘proper adults’. The few parties I attend or host usually involve little kids, not chic adults in stylish surroundings, with free-flowing booze and delicious food. But that’s exactly what Jacquelyn’s launch party was. Meeting Jackie was definitely the highlight of the night. She’s so fun and bubbly and sweet. There was a lot of squeeing and giggling and talking about books and it was just perfection. We were there to celebrate her and her books, so what I didn’t expect was for her to gush over me. She told anyone who came near us about my bookstagram pics of London Belongs to Me and London, Can You Wait?, even whipping out her phone a few times to show people my pictures. I’m not used to people gushing about me or singing my praises, so it was unexpected and wonderful! Besides meeting Jaquelyn, we also got to meet and chat with her husband and several of her friends. I have major social anxiety and I’m terrible at small talk (and talking to strangers in general), but everyone was so welcoming and lovely, and I was actually really proud of myself for being able to carry on conversations. It didn’t hurt that a lot of said conversations included topics like writing, books, and fangirling over celebrities. Then there was the food. Oh. My. God. The food. Mini fish and chips, beef sliders, mushroom and scallions on crisp bread, puff pastry with cheddar, and much more. There was also an open bar, so Krista and I both tried a cider, and then she tried an ameretto sour while I had a rum and coke. Then there was dessert! Jacquelyn had a table of beautiful chocolate sprinkle cupcakes from Dlish Cupcakes, plus platters of cookies and brownies, and at the end of the night, there were mini ice cream pots! 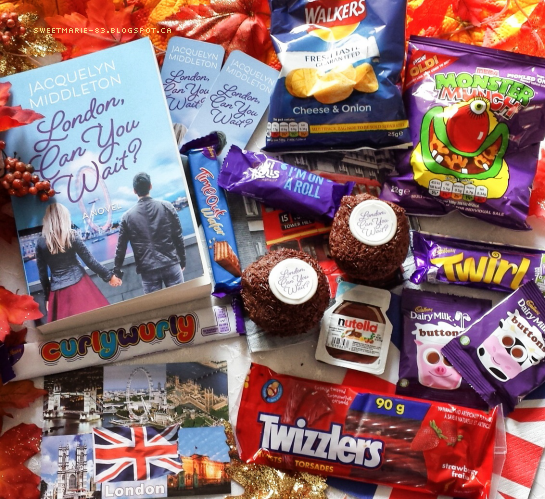 On top of all that amazingness, there were also goodie bags, filled with British treats from the book. Did I mention this was the best party ever? Because Jacquelyn is amazing and generous, she’s allowing me to host a giveaway on Instagram for signed copies of both London Belongs to Me AND London, Can You Wait? I really do love these books so much and I’m constantly pimping them, so I’m thrilled to have the chance to give them away, and I’m so touched by Jacquelyn’s endless generosity and how amazing she is to her friends and fans. Head over to my Instagram to enter the giveaway. It runs from today until next Monday the 4th, and is open internationally. 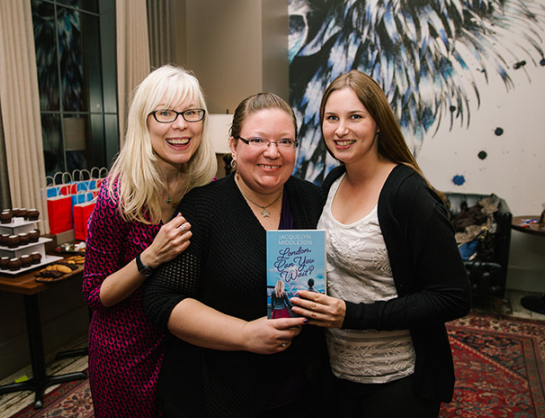 Have you ever attended a book launch? How about a book signing? Have you read either of Jacquelyn's books?